PITTSBURGH (AP) — Here’s another adjective Pittsburgh Steelers coach Mike Tomlin can call his ill-timed two-step onto the field last Thursday night against Baltimore. The NFL fined Tomlin $100,000 on Wednesday for interfering with Baltimore’s Jacoby Jones on a kickoff return in the third quarter of a 22-20 loss to the Ravens on Thanksgiving night. The fine is the second-highest ever levied by the league on a head coach, behind only the $500,000 the NFL docked New England's Bill Belichick in 2007 for spying on an opponent’s defensive signals. There is also the chance the Steelers have a draft pick taken away “because the conduct affected a play on the field.” Though he was not penalized, the league said the Steelers should have been flagged 15 yards for unsportsmanlike conduct. All that from what Tomlin called an “embarrassing, inexcusable” case of being “mesmerized” while standing in a restricted area that separates the sideline from the playing field and staring at the video board during Jones’ 73-yard return. Jones had to swerve to avoid running into the coach and was tackled during a return that might have gone for a touchdown if not for the obstruction. Tomlin briefly stepped onto the field before he jumped back. Tomlin insists the “blunder” was not intentional but has no plans to appeal the ruling. Jones didn’t blame Tomlin for his own inability to score on the return but allows it put the coach and the league in a difficult position. Tomlin said he was following his normal routine on the play and said standing on the 6-foot wide strip is common practice. New York Giants coach Tom Coughlin didn’t disagree. Coughlin drew a 15-yard flag during the preseason for stepping onto the field during a field goal attempt. Tomlin's players leapt to his defense in the immediate aftermath, and safety Ryan Clark allowed he is “always on the field.” The 12-year veteran, however, is hardly surprised the NFL is considering taking an extra step of stripping the Steelers of a draft pick. Quarterback Ben Roethlis­berger doesn’t believe Tomlin’s near-trip will serve as a distraction for Pittsburgh (5-7), which remains in the playoff hunt as December begins despite an 0-4 start. The league will not determine whether to take a pick away from Pittsburgh until after the draft order has been set. It would be an unprecedented move for a coach getting involved during a live play. 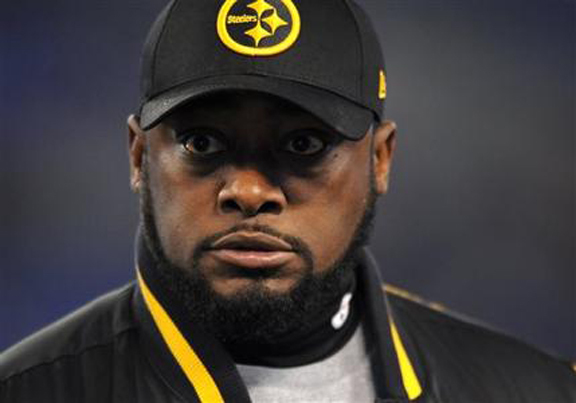 Tomlin is hardly in danger of losing his job, and said Tuesday he had not spoken to team owners Dan and Art Rooney II about the situation. Tomlin makes $5.25 million a season and the fine constitutes less than 2 percent of his annual salary. He can absorb the relatively small financial hit. He’s far more concerned about the uncomfortable position he put the league and the Steelers in after failing to get out of the way with any sense of urgency. Tomlin’s predecessor, Bill Cowher, raised eyebrows but not the ire of the commissioner’s office in 1997 when he feigned tackling Jacksonville’s Chris Hudson as Hudson ran back a Pittsburgh field goal attempt for a touchdown on the final play of a 30-21 Jaguars victory. While Tomlin has no plans to change the way he goes about his business, he plans to do a better job of policing himself. The 41-year-old understands this will stick with him once the furor dies down. His goal is to make sure it doesn’t stain the team as well.